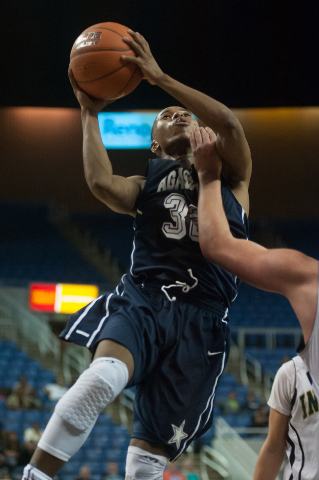 RENO — Deishuan Booker has been an offensive force for Agassi Prep all season, and Saturday was no different. 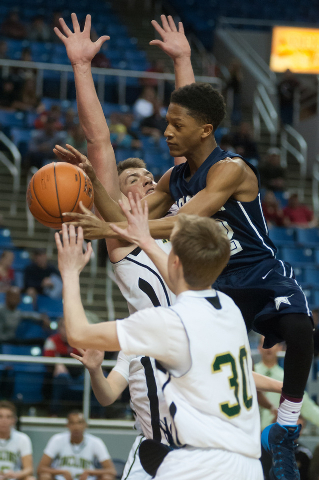 But it was the junior guard’s defense in the second half that sparked the Stars to a state championship. 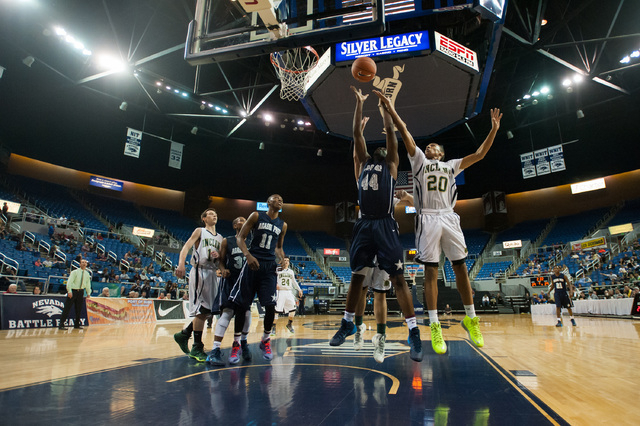 Booker had six steals in the second half and made things more difficult on Incline’s Orin Porter as the Stars rallied for a 71-60 win in the Division III boys title game at Lawlor Events Center. Porter scored the final six points of the first half, all coming in the final 38 seconds, to give Incline a 36-31 halftime advantage. And though Porter had 14 of his 26 points after halftime, Booker made him work for every one. And Booker’s six steals also helped get the Stars (26-1) going on offense. 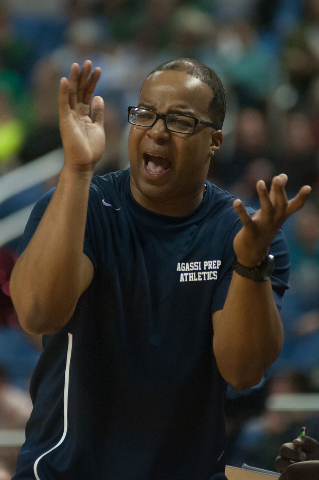 “When we switched Booker on (Porter), it made them try to rush a couple things, and he got a couple turnovers and a couple easy looks for us on the break, and it turned the game around for us,” Agassi Prep coach Trevor Diggs said. Booker had 19 of his game-high 30 points in the second half. He added seven rebounds and eight assists. The Highlanders used Agassi Prep turnovers to score four of the final six points of the first half, but it was the Stars forcing the miscues in the third quarter. Incline (23-7) turned the ball over seven times in the third quarter, allowing Booker to get out on the break and score or find a teammate. Booker said that also bothered Incline, which is used to setting the pace. The Highlanders scored 98 points in the semifinals. 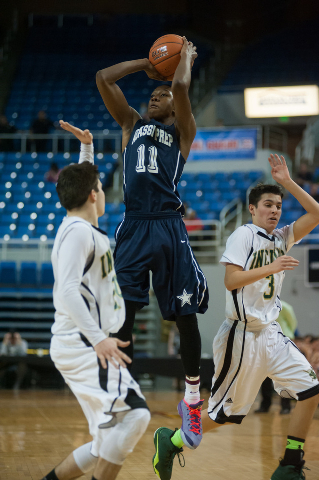 The Stars also got a huge performance from junior Kenneth Hatano, who had 20 points and 10 rebounds. 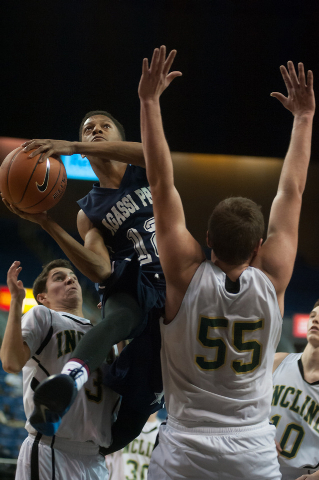 Hatano didn’t score in Agassi Prep’s semifinal win. 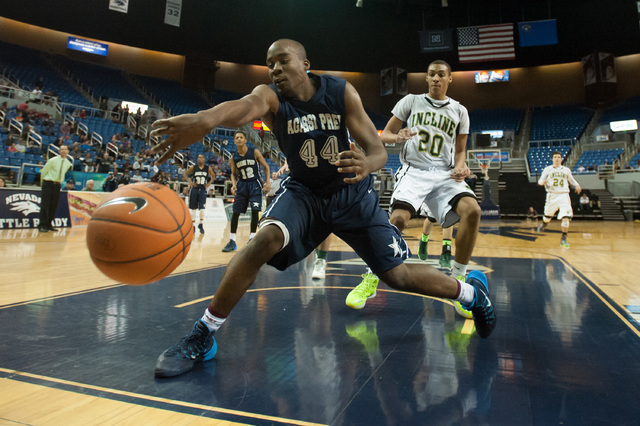 The Highlanders hit 13 3-pointers in the semifinals, but Agassi Prep made things more difficult on them Saturday. Incline was 5-for-13 on 3-pointers in the first half but 1-for-11 after halftime. 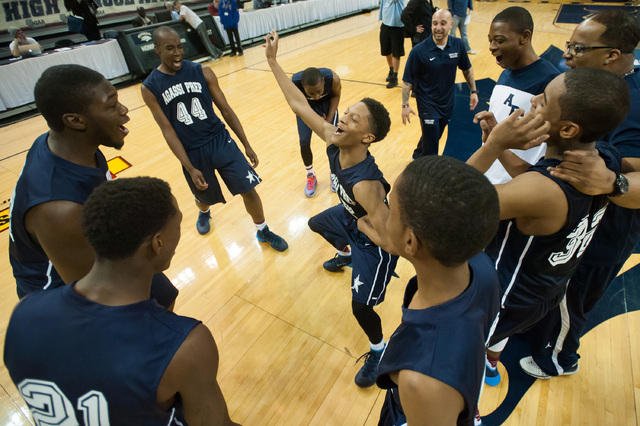 It was the second state title for Agassi Prep, which also won the championship in 2011. Diggs said he was proud to bring home a crown in his first season as coach. “On a personal note, as a first-year head coach, you can’t ask for nothing more,” Diggs said. “I’m a new coach, a new face at the school, and the guys just bought in to play hard and defend. In the Division III girls final, Molly Franklin scored 20 points to lead Incline to a 53-38 win over Pershing County.